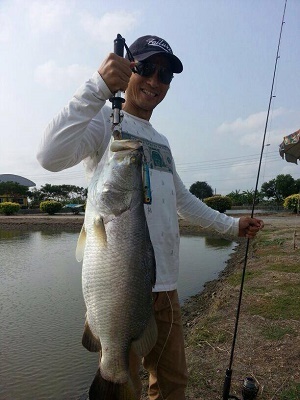 Another trip fishing at the Barramundi ponds in Bangkok saw the client starting to fish nice and early. On arrival the angler cast his lures amongst the numerous showing fish and was rewarded with an instant take. The Barramundi threw itself immediately out of the water in an attempt to dislodge the trebles hanging from its jaws. Several more acrobatic jumps followed before the Barramundi was ready for netting. At 4kg the fish was a good start and was soon followed up by several more Barramundi of a similar size. Changing lures on a regular basis saw the angler remaining in contact with the Barramundi for most of the day with action coming his way thick and fast throughout the morning and early afternoon. After a short break for lunch the angler was soon back in business moving from one pond to another after extracting several Barramundi from each pond. The fishing continued at the same break neck pace with almost a fish every cast aggressively striking the anglers carefully fished artificial lures.